A compromise, which would look a bit nicer than normal while staying away from 3D water, which might not be coming any time soon, would probably be a fine ripple bump/normal map on the water sphere of planets. Currently water is flat as a sheet and some kind of action would make sunsets that bit better. I agree. Doing something like what is done in Orbiter so that the specular reflection has some apparent "texture" to it, rather than a smooth spot, would be nice. 1. From space: Orbiter style! 3.Up close: a single, animated texture, repeating over and over again; and only one copy is stored in memory; even if the animation is just a few different seamlessly tiled textures, blending the first to the second, and then the second to the third, etc. I don't think that an animated texture could be implemented without significant work. And if you're going to invest significant time and effort into the water then you should just do it all the way and make it truly fancy 3D water. Orbiter style seems like the best way to improve it without involving many weeks or months of effort. It doesn't matter much if it's flat, as long as it's not smooth (meaning a smooth reflection). And keep in mind, some worlds will have flat or nearly flat seas, like Titan. A little texture gives the illusion of an active and varied surface well enough. Height is not always necessary. And animations can sometimes look worse than the original static presentation. All else being equal, keep it simple. Couldn't SE just add a tiled, perhaps animated, bump map? To the water? For issues with animation, see my post above. As for the bump map, an ocean with swells that don't move looks even less real than a flat ocean, though it could possibly look ok if the layer rotated, but then the features would move at different rates at different latitudes and would look weird. For issues with animation, see my post above. Well, I don't know how difficult it would be for SE, but I know in max, animating a texture is simple. And I would disagree on flat being better than a nonmoving bump map. Sure it would look odd, but it does now, too. would it be possible to generate clouds similar in quality as seen over Earth? The problem is not the generation of continents, but the erision of coast lines. There are more well defined and eroded coast lines in earth than in Space Engine procedural planets. And sometimes, I find some landsapes made of small isles . I think these need to be more rare. I wonder how easy it would be to implement a simple erosion proccess? It doesn't neccesarily have to be some kind of complex proccess, just use a fractial procedural thing and have it randomly erode n for x number of times (yes I know that is actually an oversimplication). If anyone's seen the latest versions of Gogle earth with the atmosphere effects, the newer water surface actually looks really good. I think they are using an animated texture (with an animated specular map), except it's a higher resolution than it used to be. I know animated textures have been talked about a bit, and that it may take lots of work to implement them, but maybe Google's method could provide some more insight? Is that OutTerra: Anitworld I smell? I imagine that volumetric clouds and dynamic water / sea are going to take an awful lot of work to get implemented into SE but when eventually they do, it's going to be so incredibly mindblowing and beautiful that we'll never need to see anything good or nice ever again. 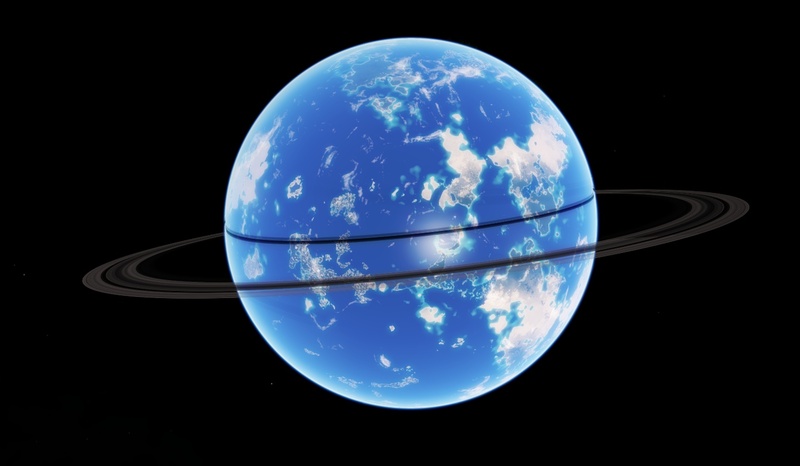 I see some people have been referring to Outerra, I came across this guy who looks to have a different approach, the water is just incredible, particularly the transparency when he looks down at the underwater land, I really hope we will one day get this in SE and I think the idea of some planets having huge waves like skyscrapers would also be incredible and probably feasibly realistic out there in the real universe. I was having a think about the pseudo rivers while being driven on a long journey. I thought of something that Space Engineer has probably thought of, for how to implement realistic rivers in what seems to me to be a reasonably straightforward way. I got out a notepad and jotted down some thoughts. I used to do game development in college, but I wasn't cut out for the physics maths or intense data structures, but I got a good way into programming. That said, it's been at least 4 years since I wrote any significant amount of code, so I'm beyond rusty, but I think I have retained a feel for how a system runs through code, and what ought to be possible, and relatively inexpensive to process. I'm neither an expert in programming, nor computer logic, nor fluid dynamics, so I'm on shaky foundations, I concede that. Apologies if this is an idiotic approach. I'm posting it here because I couldn't find an exclusive "rivers" thread, and I'm not sure it deserves a thread of its own (though mods, feel free to move it to one). When a terra or titan (or lava, or whatever) planet's surface is being generated, "springs" are procedurally dotted around the map. Springs have an "outflow rate", or similar variable, which affects the way the water behaves. The "terrain" heightmap is duplicated as the "water" heightmap, both of which are altered as the process continues. A sea-level is still set in the planet's script, but the current implementation, the water-sphere, is not used. The "outflow rate" of the spring becomes the "water volume" (or a more suitable term) of the pixel of flowing water. This affects the chances of the pixel "flooding" neighbouring pixels that are lower than it, but not the lowest. Slope angle will inform this, so that rivers on a shallower slope spread out more, and stand greater chance of bifurcating. This should allow for river divisions, delta behaviour, and multiple out-flows from lakes with reasonably level banks. Each such bifurcation will take a chunk of the "water volume" for itself, and perhaps a "precipitation rate", attenuated for altitude could top it up as the river flows on. For lakes "forming", some evaporation function, derived from the planet's atmospheric pressure and the altitude of the lake decides the fill-height of the lake, which is to say, the cut-off level if the hole it's filling is so deep as to not find a lower pixel before a certain depth. The game passes a variable for the "lowest point" yet encountered by water from each "spring" from pixel to pixel as it checks. Once the outflows occur, or the evaporation point is reached, the surface level of the lake is set to the height of the rim pixels. Note, I don't see lakes as requiring any special data structure, save perhaps a pixel flagged at the lowest point of the lake in order to propagate the surface height back to... not sure if that's necessary. As basins fill, they may overflow and subsume other lakes filled by other springs. The "lowest point" variable is overwritten in those cases by the lowest value. They may also inundate existing "springs". These "springs" are deleted, and their "outflow rate" is added to the "water volume" of the water that passes over them. Once all evaporation points are reached, the body of water with the lowest "lowest point" variable on the planet becomes the sea, and floods to sea-level, regardless of it's evaporation point. This would allow for inland lakes and isolated seas to have a lower level than the ocean. That's the general idea. I was thinking that the water surface could be written to the blue of an RGB file, the green would be water-carved bottom of the rivers and lakes (subtracted from the terrain heightmap by the "water-volume" of each pixel), and the red could be... I don't know - whatever else needs storing - energy, flow-rate, perhaps, for deciding on the speed of texture-scroll, based on slope angle. Now, one potential flaw I can think of is how the LODs generate smaller and smaller detail, and that, what might have been a smooth slope at low detail, with a straight river course, suddenly becomes rugged at higher detail, affecting the course of the river, and even breaking it up. I have a half-formed thought in my head that the lower-res LOD could be blended into the higher-res one, somehow, with each progressive LOD, in such a way that would imitate the effect of epochal erosion by the changing course of the river over time... but that one needs more thought. I'm sure that there are plenty of flaws, like that this would require so many iterations through the terrain generator as to grind the game to a halt... but I'm not sure whether that's the case or not. Hopefully smarter brains than mine can take a look at this, and I'm really sorry if I'm wasting everyone's time.